This collection has a beautiful grouping of strawberry blossoms, large blooms and even a few running stitch designs and the most important part....that sweet, bright red berry! As you can see in our samples, this collection is great for any home decor project or even embroidered on a garment. We created a cute apron from a couple of linen napkins that was so simple! We also embroidered a few pairs of Capri's so you can see that this design collection looks great even on clothing! 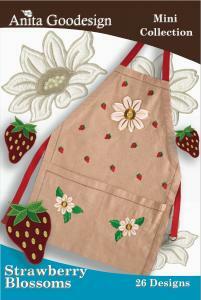 So, get creative and enjoy the sweet spring bounty of strawberries with the "Strawberry Blossoms" collection!